Happy Birthday, Ray French, John Hall, Stan Javier, Harley Payne, George Crable, Ivan de Jesus, Ferrell Anderson& Otis Nixon! Put this on your calendar. Via Harry Yadav at the South Pasadena Review; "Joe Davis, LA Dodgers Broadcaster, in Conversation at South Pasadena Public Library on January 29." Per Rowan Kavner at Dodger Insider; "Dodgers announce 2018 Minor League coaching staffs." The managers of the Dodgers’ top three affiliates remain intact, while new skippers are in place for Single-A Great Lakes, Rookie-advanced Ogden and Rookie-level AZL. Here's an old friend alert. Per Rich Scarcella at the Reading Eagle; "Scholastic baseball: Billingsley excited to be coach at Weiser." "I love the game of baseball," he said. "To be able to still be a part of it and to be able to help kids, I'm really excited. Hopefully we can turn the program around. I know it's been struggling the last couple years. Hopefully we can build a program that kids feel proud to be a part of. That's my vision." Per Ashley Varela at NBC Sports; "Dodgers sign Zach Neal to a minor league deal." The 29-year-old righty has seen limited time in the majors since his debut with the A’s in 2016. He logged just 14 2/3 innings at the big league level in 2017, racking up a 7.98 ERA, 0.6 BB/9 and 6.1 SO/9 in six relief appearances. He bounced back and forth between Oakland and Triple-A Nashville several times throughout the year and was able to produce slightly more palatable numbers at a lower level, finishing his Triple-A run with a cumulative 4.82 ERA, 0.9 BB/9 and 3.9 SO/9 in 99 innings. Per Andrew Mearns at Cut4; "Kenley Jansen went to the Rams' playoff game as the guest of Hall of Famer Eric Dickerson." Per Ken Gurnick at MLB.com; "Dodgers launch Global Sports Venture Studio: Innovative platform will connect emerging startups with partners." "The Dodgers' organization has seen great success with our previous accelerator programs by embracing disruption and taking a close look at new technologies and shifts in consumer behavior," said Dodgers chief financial officer Tucker Kain. "We now want to open up this platform for others in the global sports and startup ecosystem to experiment with innovation, share success and grow as an industry." 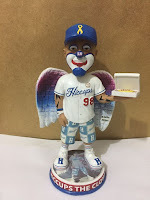 Per Tom Hoffarth at the Pasadena Star News; "How a bobblehead honoring Dodgers superfan Hiccups the Clown pays it forward in LA."